Norman Lebrecht's Slipped Disc has reported that John Evans, former President of the Oregon Bach Festival (2006-2014) and former Head of Music on BBC's Radio 3, has died at age 62. The cause of death was a heart attack. On March 27, 1914, 20 year-old Leo Ornstein shocked audiences and critics at his Steinway Hall recital in London during which he performed his revolutionary Three Moods for solo piano and Danse Sauvage. The critic for the London Daily Mail described the event as a "wild outbreak," while another reviewer wrote, "We have never suffered from such insufferable hideousness, expressed in terms of so-called music." However, based on the attention that concert received, Schott published some of Ornstein's music for the first time. Famous as a wunderkind, Ornstein would compose into his 90s and live until 2002 to become the oldest composer in American music history. Harry Rabinowitz (1916) - turns 100 today! PSU Opera has invited Frederica von Stade for a visit, which will include a master class. Here are the details if you would like to meet her or see her in action. 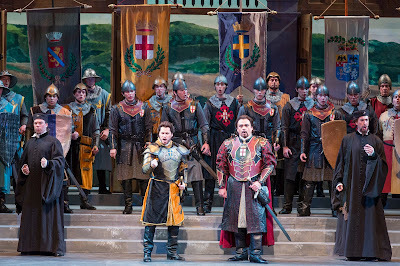 The Classical Voice of North America has posted my review of Sarasota Opera's final concert, which celebrated the company's Verdi Cycle - a 28 year effort to perform all of his works, including his operas, choruses, orchestral pieces, songs for voice and piano, and piano pieces. While in Sarasota, I attended a conference that featured Verdi scholars who gave a number of presentations. One of the specialists was Emily Richmond Pollock, who is an Assistant Professor in the Music and Theater Arts Section at the Massachusetts Institute of Technology. She is a native of Beaverton, Oregon and was the principal oboist of the Portland Youth Philhamonic when Huw Edwards was in charge. 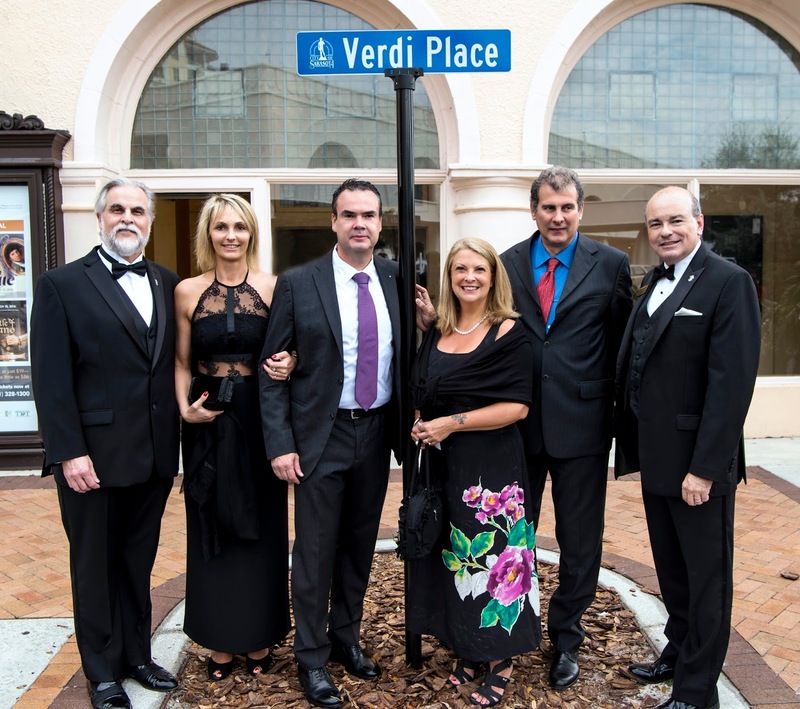 As part of the Sarasota celebration, the opera company invited members of the Verdi family. So, here is a photo of the great, great grandchildren of Giuseppe Verdi with Sarasota Artistic Director Victor DeRenzi and Executive Director Richard Russell. Digging into the compositions of Verdi’s youth, Sarasota Opera presented a concert of works that Verdi wrote before he completed his first opera, “Oberto, Conte di San Bonifacio” in 1839. Consisting of three sinfonias for orchestra, pieces for chorus and orchestra, solos with piano, and some fragmentary works, the Young Verdi program helped Sarasota Opera to fulfill its claim to be the only company in the world to have played all of Verdi’s works (that includes his 27 operas and 6 alternative variations). Although the works on the program showed that Verdi had not found his voice, the music did reveal some Verdi-like tendencies, such as the way that he made some lines sound heavier. All of the pieces were conducted by Sarasota Opera's Artistic Director Victor DeRenzi and featured the young artists of the company as soloists or as part of the chorus. The choral works were sacred pieces that the chorus sang with vigor, but none left much of an impression. Even the “in convertendo Dominus” (Psalm 125), which featured five excellent soloists from the company’s bevy of young artists, relied on a declamatory style that didn’t match up well with much of the text. The piano and voice selections dwelt primarily on unrequited love and its laments. All were delivered with ardent fervor by young artists of the company. Soprano Elizabeth Trendent, in particular, excelled in her delivery of “Perduta ho la pace” (“My peace of mind is lost”) and “Deh, pietoso, oh Addolarata” (“O Sorrowful Mary”). The loveliest gem of the evening was a nocturne for three voices, piano, and flute entitled “Guarda che bianca luna” (“Look, what a bright moon”). It had a sweet lyrical side that was wrapped in a simple melody, revealing a sense of what Verdi would do later whenever he created memorable intimate music. The first of two fragmentary pieces on the program, simply titled “Piano piece in 6/8,” took listeners on a pleasant journey in the space of eight measures. The other one, “O virtu che provvidente” (“O virtue that wisely”), written for piano and female chorus, offered a lilting melody before stopping suddenly. The piece was taken from an auction catalogue that had displayed only the first page. Apparently the rest of the piece is owned by a private collector who did not intend to reveal the rest of the goods. All three sinfonias were one-movement works that were influenced by Rossini and perhaps Mozart. Played with verve by the orchestra, they might have been more interesting if the woodwinds could have softened up a bit during the quieter passages so that the strings could have come through better. After enthusiastic applause at the conclusion of the concert, DeRenzi told the audience that he and the orchestra preferred the Sinfonia in C major so they played it as an encore. Judged by the vigorous production of Giuseppi Verdi’s “La battaglia di Legnano” mounted by Sarasota Opera, you’d figure that it would be a staple of many opera houses. Yet this opera remains little known for the most part because of Verdi cranked out so many operas that most companies are kept plenty busy circulating his best ones. So it was truly a special occasion to witness the performance on March 16th at the Sarasota Opera House where the company was completing its cycle of all of Verdi’s works in a monumental effort that began 28 years ago. Written in 1848, “La battaglia di Legnano” is the fourteenth of Verdi’s operas and grouped with his early works. Like “Il trovatore,” it has the framework of a melodrama but with fewer memorable melodies. Inspired by an actual battle that took place in the Twelfth Century, the story revolves around a Veronese warrior, Arrigo, who had been wounded in battle. Because Arrigo was reported to have been deceased, his beloved, Lida, married his best friend Rolando. Arrigo, however, has not died, and shows up in town where is welcomed by Rolando. Arrigo and Lida still have strong feelings for each other, they are in a terrible bind that is made worse because Lida has had a son by Rolando. Rolando figures things out and locks both of them in a room so that Arrigo cannot get to the field of battle to defend the town, thereby becoming totally dishonored in the eyes of his countrymen. Arrigo overcomes his prison by jumping off the balcony to join the battle. He then becomes the hero of the battle of Legnano but is mortally wounded. Before his expires, he is reconciled with Rolando and Lida. Sarasota Opera’s production was led by the dashing Martin Nusspaumer who cut a terrifically heroic figure in the role of Arrigo. His voice had a robust resonance from to bottom, but he had problems negotiation the highest notes cleanly. He may have been suffering from a cold or perhaps his problems were an indication of something more serious with his vocal chords. In any case, he finished the opera without relinquishing the role to a cover singer. Jennifer Black’s strong singing and acting revealed Lida’s conflicted emotions, but it was the Rolando of Todd Thomas that really plumbed the depths of character. His wrath against his wife and his best friend were frightening, and his love for his son had a genuineness that could be felt all the way to the back of the balcony. Young Bok Kim conveyed the steely nerves of Federco Barbarossa with terrific gravitas. Tara Curtis gave a solid performance as Lida’s handmaid Imelda. Eric Lindsey and William Roberts distinguished themselves as consuls of Milan as did Costas Tsourakis in the role of The Posestà of Como. The soldiers choruses had a robust quality that verged on blood-thirstiness, and the townspeople held nothing back whether they feared becoming consumed by Barbarossa’s troops or celebrating the victory of the Lombardi forces. Chorus Master Roger L. Bingaman deserves plenty of credit for the uniform excellence of his singers. Artistic Director Victor DeRenzi commanded the orchestra expertly, and their sound was well polished. Even the church bells in the final measure could be heard amidst the rising crescendo of the orchestra and singers. But there were no pianissimos in the production, after an hour of mezzo forte to double forte, more dynamic variation would have been welcome. If symmetry is a virtue in staging, then this production was of the highest order. Director Martha Collins was amazing consistent in keeping the main characters in the center and everyone else balanced equally from left to right throughout the production. The scenery designed by Jeffrey W. Dean embraced the idea of symmetry wholeheartedly and captured the imagination as well. Howard Tsvi Kaplan’s traditional costumes perfectly complimented the entire effect as did the lighting of Ken Yunker. Hopefully another opera company in the U. S. will try to produce this opera. It would be a shame to have to wait many years for Sarasota Opera to revive it. For some, it will be worth the wait in any case. It's a muggy day here in Sarasota, Florida. I am in Florida's Gulf Coast to sample Sarasota Opera's final blowout of Verdi operas with some reviewer colleagues and Verdi scholars. The company is the only one in the world that has done all 27 of Verdi's operas plus the 6 alternative versions plus all of Verdi's sacred and secular works, including fragments of pieces. So on Wednesday evening I heard "The Battle of Legnano" and last night was a concert of pieces written by Verdi in his youth. The Music Critics Association of North America (yes, there is a passel of music critics) arranged for this excursion to the Gulf Coast side of Florida, courtesy of Visit Sarasota County, which is sponsoring us. Bloch’s Violin Concerto is a rare number on most orchestral programs, but Kwak, who is in her fourth year as the orchestra’s concertmaster, made a strong case for it to be reconsidered. She beguiled the audience with arabesque-like figures above the orchestra and executed the animated passages with panache. Her cadenza in the first movement seemed to dwindle down to nothing before climbing out of the depths and then finishing off with the orchestra in full bravura fashion. One of the highlights of the second movement came when she suspended a bewitching ultra-high yet soft tone that quietly grew into a lovely melody. Her exchanges with the orchestra in the third had a playful echoing effect. The orchestra accompanied Kwak deftly – including some marvelous fanfare-like passages – and made the piece breathe. There were sections that seemed to have a repetitive pattern that suggested a Native American influence, but, overall, the music-making by Kwak and her colleagues connected with listeners very well, and she received an enthusiastic standing ovation that brought her back to the stage four times. In Copland’s “Quiet City,” the orchestra laid down a carpet of pure calm and solitude that was sprinkled with enigmatic mutterings from soloists Work and Mustain. Copland wrote the piece as incidental music for a play by Irwin Shaw in which a young trumpeter expresses his frustration with his situation one evening. The sounds that Work emitted had a slightly nervous quality that perfectly reflected the tenuous thoughts of that character. Mustain’s plaintive passages seemed to counter Work’s in a way that was complimentary. From the Copland, the orchestra segued without pause to Bartók’s Suite from “The Miraculous Mandarin.” Starting with a wild cacophony of strings and brass followed by a gritty and lowdown line from the violas, everyone in the hall knew that they were in for something extraordinary even though the storyline – as reflected in the supertitles – was not particularly uplifting. The idea of an orchestra depicting the squalid life of three thugs using a girl to entrap men and then fleece them is not something that sounds inviting. But the superb musicianship of this orchestra – guided by Kalmar – really brought out the Tarantino-Pulp-Fiction-eque dimensions of the piece, making them heart-stoppingly visceral. Principal Clarinetist Louis DeMartino, Bass Clarinetist Todd Kuhns aided, and bassoons – abetted by the strings – laid down a line of tension and entrapment that teased the mind unmercifully. It was easy to picture the enticing girl by the window and the old rake (snarly trombones) and the young lad (oboe and English horn) and the ensuing violence after the thugs found out that they had not money. The situation ratcheted up a notched when the girl seduced the wealthy yet frightening Mandarin and the chaos after she tries to escape his clutches and the thugs finally seize their prey. The orchestra went full tilt in a furious frenzy though the final measures – and as the applause from the audience started up – you could see string players tearing the frayed horse-hairs from their bows. To open the evening, Kalmar and company created wonderfully unhurried, pastoral scenes in their performance of Debussy’s Prelude to “The Afternoon of a Faun.” Superb playing by Principal Flutist Martha Long as well as the horns, woodwinds, harp, and strings evoked the idyllic and elusive reverie of the faun with invitingly warm colors. In the brief span of this piece, time just seemed to melt away and with it the cares of the world. The BBC, the Telegraph, and many other publications have reported the death of British composer Sir Peter Maxwell Davies. He was 81 years old and had suffered for the past several years from leukemia. Congratulations are in order for Portland Youth Philharmonic's co-concertmaster Fumika Mizuno, who has been selected to join the National Youth Orchestra, which is part of Carnegie Hall’s Weill Music Institute. The 109-member orchestra will receive a two-week training residency this coming June on the campus of SUNY Purchase. They will perform in Carnegie Hall under Christoph Eschenbach and then embark on a tour of Europe to play concerts led by Valery Gergiev. For more information on the NYO-USA (including a listing of all orchestra members and their hometowns), click here. PS: I just found out that this is the second time that Mizuno has been selected for the NYO-USA orchestra. She was one of the co-concertmasters last year in the "Symphonie Fantastique" concert under Charles Dutoit. The Portland Youth Philharmonic scored major points last Saturday (March 5) at the Arlene Schnitzer Concert Hall by playing Marion Bauer’s “Sun Splendor,” a short, one-movement work that was last heard in 1947 when the New York Philharmonic performed it under Leopold Stokowski. Bauer, who was born in Walla Walla, lived in Portland for a decade or so before moving to New York and studying music for a while in Europe. She wrote “Sun Splendor” for piano in 1926 and orchestrated it during the 1940s. It would have been interesting if Bauer’s piece had sparked other performances, but “Sun Splendor” quickly faded quickly into obscurity. So, it was a stroke of luck that PYP’s music director David Hattner heard it and decided to program it on the orchestra’s Winter Concert, which also featured the Concerto for Oboe and Strings by Ralph Vaughan Williams and Sergei Rachmaninoff’s Symphony No. 3. Following the Bauer opener, Anna Larson, the winner of the orchestra’s annual concerto competition, gave an outstanding performance of Vaughan Williams’s Concerto for Oboe and Strings. Larson, an 18-year-old senior at Sam Barlow High School, mastered the fluid lines of this piece with a secure and warm tone, supported with great sensitivity by the string chamber ensemble . Her beguiling languid phrases created an atmosphere of gentle, rolling hills as if she were trekking through England’s pastoral countryside. The fast passages had a light and nimble flair, and she topped everything off with an exclamatory high note at the end. The parade of bouquets that she received was well deserved. After intermission, all of the forces of the PYP returned to the stage to deliver a vivid interpretation of Rachmaninoff’s Third Symphony. Excelling with dynamic contrasts and evocative sonic textures, the orchestra delved into the music with an emotive and polished performance. Lush strings that could turn edgy with the flick of Hattner’s baton, brilliant brass, plaintive woodwinds, and a sharp percussion battery contributed impressively. The contrapuntal passage in the third movement was superbly executed, and made me wish that Rachmaninoff had extended it further. Outstanding playing by the principals in their solos included concertmaster Fumika Mizuno, cellist Richard Lu, flutist Annabel MacDonald, oboist Courtney Stump, clarinetist Talia Dugan, bassoonist Rose Rogers, hornist Elise Morgan, harpist Siena Mirasol, and keyboardist Raley Schweinfurth at the celeste. Clayton Wahlstrom (bass clarinet) and Emma Barbee (English horn) plus the trumpets were spot on. Music can be the language of obsession in more ways than one as 45th Parallel concertgoers found out on Friday evening (March 4) at The Old Church. Whether fixated on the music of Bach, or on music as an outgrowth of unrequited love, or on music as a purely unrelenting series of sounds, members of 45th Parallel played the concert program as if possessed, delivering intense interpretations of works by J. S. Bach, Eugène Ysaÿe, Leoš Janáček, and Johannes Brahms. To kick things off, violinist Gregory Ewer gave a commanding performance of the “Preludio” from Bach’s Partita No. 3 in E major (BWV 1006). He handled the phrasing of its seemingly endless series of sixteenth notes and the various voices with panache and shaped the music with agile dynamics. The warm acoustic of The Old Church enhanced the flashy piece, making it sort of well…. inviting. The Bach was paired with the “Obsession; Prelude” from Ysaÿe’s Sonata for Solo Violin, No.2, which starts with a quote from the “Preluido.” Sharply played by Adam LaMotte, the piece also has rows of sixteenth notes that alternated between inspired fragments from Bach and fragments of the “Dies Irae” from the Catholic mass for the dead. Deft fingerwork and bowing by LaMotte made the virtuosic piece look easy peasy. Ewer then came back on stage to bring the house down with a scintillating performance from memory of the “Chaconne” from Bach’s Partita No. 2 in D minor (BWV 1004). Ewer shaped the piece well, letting the slower sections unwind naturally before unreeling some shockingly fast runs. When he created two voices – an upper one against a lower one, it was as if he were fashioning an extended conversation between two people. After finishing, Ewer’s superb performance drew ovations from the enthusiastic audience. Leoš Janáček’s String Quartet No. 1 (“Kreutzer Sonata”) was inspired by Leo Tolstoy’s novella “Kreutzer Sonata” in which a husband suspects his wife of having an affair with her music partner. The story culminates in a fit of jealous rage in which the husband stabs his wife with a dagger after she plays Beethoven’s “Kreutzer Sonata” with the violinist. The other intriguing background in regards to the piece was Janacek’s own obsession with a married woman and the numerous unsolicited letters that he wrote to her. For the 45th Parallel concert, Janáček’s quartet was performed in a slightly unusual way – with actor Beth Thompson reading sections of Tolstoy’s story before each movement was played. Thompson’s reading was incisive (except for her pronunciation of “Kreutzer”) and inspired, and it was easy to feel how the story related to the music. Violinists Ewer and LaMotte, violist Charles Noble, and cellist Justin Kagan played with verve and intensity, creating an edge-of-the-seat experience. Grumblings from the cello, nervous chattering from the upper strings, and visceral, snarly eruptions from all sides signaled the doubt and fear plagued the mind of the story’s protagonist. Even when the mood relaxed a bit, it seemed that an ominous mood was always in the background. The musicians created tension that knifed about and finally exploded with a series of darting phrases in the final movement followed by an accelerated heartbeat that raced to the end of the piece. Brahms’s long term, unrequited love for Clara Schumann was perhaps crystallized to the greatest degree in his Piano Quartet No. 3 in C minor, which he finished in 1875 after putting it aside for 20 years. The piece received an emotive performance by pianist Janet Coleman, violinist LaMotte, violist Noble, and cellist Kagan. I only wished that the piano had a brighter tone, but Coleman made the most of it with sensitive playing that balanced extremely well with the strings. While the first movement seemed to need a bit more shape, the three remaining ones were extremely satisfying. The thrilling finish on the second movement, the lovely, lyrical melody by the cello and piano at the beginning of the third, and the violin and piano duet at the start of the fourth were some of the highlights that made this performance memorable. Nikolaus Harnoncourt, a conductor who helped to define early music performances and influenced modern orchestral interpretations and opera, has died at the age of 86 at his home in St. Georgen in Attergau, a village located west of Salzburg, Austria. You can read his obituary in The New York Times and The Guardian newspapers. Igudesman & Joo will be performing with the Oregon Symphony this Sunday evening at the Arlene Schnizter Concert Hall. The duo consists of classical musicians Aleksey Igudesman and Richard Hyung-ki Joo, whose shows combine comedy with classical music and popular culture, including country western, rap, and jazz. They are hilarious and at the same time top notch musicians. I talked with Joo over the phone while he was getting ready to rehearse one of their shows in Seattle. Here is part of our conversation. How long have been performing as a music/comedy duo? Joo: Officially as a duo, we are 12 years old. That’s ironic, because we met when we were 12 years old, and mentally we are still 12 years old. I read that you met each other while studying at the Yehudi Menuhin School in London. Joo: Yes, that’s where we met when we were 12 and the madness all started. It was a very small school with a maximum of 50 students. We were very lucky that Menuhin was still around in those days. His inspiration definitely rubbed off on us. Besides being one of the world’s greatest violinists, Menuhin was a humanitarian, a very open-minded person. He was probably the first serious classical musician to cross over and play with musicians like Stéphane Grappelli, Ravi Shankar, and Duke Ellington. He also had a wonderful sense of humor. He practiced yoga until his last day, and he could stand on his head. He directed the Berlin Philharmonic a couple of times while standing on his head and waving his legs. We think that had he lived a little longer and seen our show, he would have liked it. So your humorous skits started while you were in school? Joo: We developed some things while we were still in school, experimenting with ideas. We wanted to create a concert that we would want to go to ourselves. We found classical concerts an alienating experience even for ourselves as passionate, idealistic students. We found ourselves getting uninspired and the whole ceremony pretentious, stuffy, and off-putting. We decided that we would make our own concerts according to what we desired. We went to a lot of theater and plays – especially Chekov, Wilde, and Shakespeare. We both grew up Monty Python. So, we thought that we would try to combine all of these elements in to one concert. Many years later we looked into our history books and realized that what we are doing is quite retro. Victor Borge, Peter Schickele, Anna Russell and others paved the way for performing musical humor. Joo: Yes, and although Schickele is still creating pieces, he and the others you mentioned come from a time when classical references were more of a part of daily culture. Sadly, today we are less cultured in the area of classical music. I mean, in the 50s, 60s, and 70s Leonard Bernstein’s Young People’s Concerts were televised. Nowadays, even if something like that were to occur, it wouldn’t be televised. Back then, many homes still had a piano – even the lower and middle classes – but that all changed with the radio, TV, and the popularization of culture. So what we do is challenging for us, but it’s a lot of fun. We have to not alienate audience by being too clever and by having too many musical jokes that only connoisseurs would get. We are serious musicians who have performed concerti and won competitions. Orchestras like to appear on stage with us because they realize that we are genuine musicians and not just clowns. For us, music is the most important thing and humor is secondary. Is your show “BIG Nightmare Music” scripted so to speak? Joo: Everything is written out, but within that framework there are many moments for surprise and spontaneity. We encourage the orchestra in rehearsal to surprise us during the show. We tell them “Look if you have anything crazy that you would like to try and always wanted to do, do it! Don’t ask us for permission as long as it doesn’t sabotage the show and ruin the music. Just be our guest. Once you give an orchestra permission to tap into their inner pranky child, the results are wonderful – especially for the audience. They see their local orchestra being human and having fun, and that is a connection on a much larger level. Can you give us an example of something that happened at one of your concerts that really surprised you? Joo: One of the numbers that we’ll do with the Oregon Symphony is a number that we call “Rachmaninoff by Himself.” In this number, I start singing to the words of “All by Myself,” and I start to get so upset that I start crying. This crying becomes so infectious that the whole orchestra starts crying as well. All sorts of things have happened when we have done this number with orchestras. So when we did this with one orchestra, that orchestra had a very timid, sweet, quiet harpist in rehearsal, but during the concert, she walked in front part of the stage and got down on her knees, wailing, and thumping the floor with her hands. It was just nuts, and she totally amazed the orchestra. We have had a number called “Dancing Violinists” where we have had all of the violinists do an Irish step dance while playing their instruments. One fellow in the orchestra had this outfit on where a woman came from behind him – between his legs – and it looked like she was going to grab his crotch – then she just pulled his trousers off – they were Velcroed – to reveal him in a tiny little kilt. Judging by the Portlandia series, we are hoping the members of the orchestra will come up with some weird stuff. President Scott Showalter today announced that the Symphony’s 2016 Schnitzer Wonder Award will go to Mia Hall Miller, founder and artistic director of the Pacific Youth Choir. The award will be presented at the Symphony’s annual fundraising gala on April 16. The Schnitzer Wonder Award was created in 2015 by Jordan Schnitzer to honor his parents, Harold and Arlene Schnitzer, and their commitment to philanthropy, fairness, opportunity, education and creativity as the heart of a strong and vibrant community. The award honors an individual or organization that directly works to build community through the next generation of artists and/or student musicians. This award comes with a $10,000 monetary prize, intended to help further the honoree’s work. Miller founded the Pacific Youth Choir 13 years ago to enrich children’s lives by developing their artistry in a joyful, caring, and nurturing environment. Now with over 290 singers in 10 choirs, the Pacific Youth Choir has gained critical acclaim, performing frequently with the Oregon Symphony and numerous other organizations. During the 2015/16 season alone, her choirs perform with the Symphony on a movie program, three kids programs, a pops program, and Mahler’s Symphony No. 3. Miller is the second recipient of the Schnitzer Wonder Award, following last year’s inaugural honoree, Bonnie Reagan, founder of BRAVO Youth Orchestras.